Gib: Cookie Jones, formally with Barbara Mandrell. Wow! What a career, Cookie! How are you doing tonight? Cookie: Doing real good, Gib. Gib: Here we are at the NTSGA Superjam 13. All the guys are here, Don Helms, John Hughey. Just goes on and on. Isn’t it a pleasure to be here with this group? Cookie: It’s always a pleasure to visit with my friends in the steel guitar industry. John, Weldon, Russ Hicks were here tonight, Billy Robinson. It’s always nice to see them. Gib: We’d like to know a little about your background. Playing all those years with Barbara Mandrell had to be fun. Cookie: It was great fun. I was with Barbara for 23 years, from 1975 to 1997 when she basically said she changed the direction of her career. I played on many of her albums, her TV shows-The Mandrell Sisters, all the major awards shows, Hee Haw, That Nashville Music, Pop Goes the Country, and had a great time with her. Gib: Barbara was one of the ladies that took the band on the TV shows with her. Cookie: The TV show was actually prerecorded on a Wednesday, and then we played to the tracks on Thursday and Friday. It worked out better that way because the girls had so much to learn. They had to do their dancing, had to learn the songs they were going to do, had to learn the comedy skits. So if we did everything in advance, they had more time to learn everything. It was better for them, better for us. Gib: That made perfect sound for TV. Cookie: They had a chance to mix all the instruments as hot as they wanted or as hot as needed. If there were any mistakes, sometimes they were left to give it that live effect. Other times we did do live to tracks. All the vocals were live to track, so the girls actually sang their parts. It wasn’t like they were lip-syncing or anything like that. Gib: Can you name two or three songs of Barbara’s that were your favorite? What do you like the best? She did such beautiful country and some gospel music, too! Cookie: She did a song when I first came with the group called Standing Room Only which featured John Hughey. It had a beautiful steel guitar intro and turnaround. Of course, I had to learn that lick for lick because that was very important. Earlier in her career she used Pete Drake who played on some great stuff. She did Country When Country Wasn’t Cool which featured Sonny Garrish on steel. There’s just a whole slew of songs; Midnight Angel, Hold Me. Hold Me had John Hughey playing again. Gib: What’s your favorite Cookie Jones song that Barbara did? Cookie: We did one called Wish You Were Here on her live album, and that was kind of one of my favorites. It had a nice steel slide in it. We did that at the Roy Acuff Theater at Opryland back in 1984-85 I think, right after the television show. Gib: How many dates a year were you doing when she was in her prime? Cookie: In the years between the TV show, we left in June for 90 days, came back the last few days of August, get in the car, drive back to Los Angeles and did the TV show again. So we were gone pretty much the whole year. We squeezed the live album in there, also. Gib: You squeezed a live album in all that? Were you sleeping at all? Cookie: We also had to drive the bus. We didn’t have a bus driver at that time, so some of the band was driving the bus and playing. Gib: Where did you grow up? Cookie: I grew up in Quincy, IL., a small town on the Mississippi River. Gib: How did you get started on the steel guitar? Cookie: The steel guitar was more or less my mother and dad’s favorite instrument. I was running through the house one time when I was seven, and they were listening to Hawaiian music on the radio. My folks asked me if I’d like to play the steel guitar. I didn’t know what a steel guitar was. I was a kid, so I said, "Yes." They took me down in a couple weeks, and I started lessons. I’ve been beating on that thing ever since.Gib: Who did you take lessons from?Cookie: There were a couple of teachers in Qunicy. One called Joe Stice was actually giving lessons on the instrument. At that time, most of it was non-pedal. He had a pedal guitar. He had a Multi-Chord, and I thought that was interesting. Gib: That was back when you used the slant bar technique. Cookie: If you’re real good at it, it sounded like you’re in tune, if not, it sounded slightly out of tune. Gib: Kinda like when I play it. 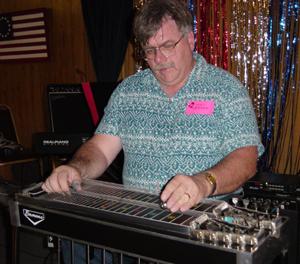 When did you get your first pedal steel? Cookie: I got my first pedal steel when I was in the sixth grade. It was a Fender 400, had 4 pedals and 8 strings. The pedals basically raised certain strings to a predetermined pitch. By using them in combination, you can actually change chords or patterns on the guitar. Very interesting phenomenon, but it works quite well. Gib: It’s one of those things that people don’t see in the audience. All they seem to remember is the bar sliding up and down. They don’t see both knees being busy, foot pedals being used by both feet, ankles bending and twisting. There’s an awful lot going on with the steel guitar. Cookie: There is alot going on with the steel guitar. I’ve had my poor steel called an electric zither. I had a guy come up and say, "You play that with your feet, too?" Yeah, there’s a lot going on with steel. You’ve got your right and left hands both going, your knees going, your feet going. Then you’re also trying to think of the chord changes that are coming up and think what you are going to play. Gib: If you were a kid today, how would you start out? Cookie: Well, kids today are a lot more fortunate than what I had growing up. There are alot of audio and video courses. Tab, the internet, has a lot of nice things. When I was growing up, you either figured it out yourself, had somebody show it to you, or worked it out off of a record. That was the only way you could actually figure it out. Gib: By using the material out there today, you can cut your time considerably, and it shows you the proper way to do it the first time, so you don’t learn wrong. Did you do anything like that? Cookie: Oh, yeah! When I first came to Nashville, I found out I was doing a lot of things wrong. It didn’t take me long to figure out where I was suppose to be and what I was suppose to be doing. Once I figured that out, it was a lot easier. There are some things that I probably still don’t play correctly. That’s just how the instrument is. You don’t have to play it right to make it sound good, but you have to play it your way. Gib: Absolutely! When did you make your way to Nashville? Cookie: In 1970, after I graduated from Quincy, I moved down here to work with a local band from Nashville that was doing road work. They needed a steel player, and I worked cheap. So for $75.00 a week, when we worked, I moved to Nashville. Gib: How long did it take to get hooked-up with Barbara? Cookie: I moved to Nashville in September of 1970, and I started working with Barbara in 1975. So there were a few years working with different artist; Lois Johnson, Charlie Louvin, and then I got the job with Barbara. Gib: Charlie Louvin must have been a great trip for you? Cookie: Charlie was a great guy. I love Charlie. He did real traditional country stuff, and it was really good to work with him. Gib: What are you doing now, Cookie? Cookie: I’m still doing some recording. I do some of the steel shows around the country. Gib: Cookie Jones, it’s been a pleasure. Thank you for taking the time. Cookie: Gib, thank you for the interview, and I appreciate it.